Twelve-year-old "Andi" Carter attracts trouble the way her palomino horse, Taffy, attracts flies on a hot summer day. Lately, she can't do anything right, from forgetting important chores to putting herself in danger with her brother Chad's wild stallion. After a particularly scary incident where Andi gets in trouble once again, she wonders if her family would be better off without her. So she saddles up Taffy and leaves the Circle C ranch. But her escape quickly leads to frightening encounters with a horse thief and a vicious young lady. Turns out life on her own is downright terrifying! Home is where Andi belongs, but how can she go back without her beloved mare? Susan Marlow's captivating characters have even more to say in this newly expanded anniversary edition of one of her classic Andi tales. 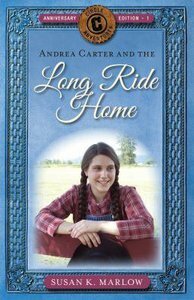 About "Andrea Carter and the Long Ride Home (Anniversary Edition) (#01 in Circle C Adventures Series)"